December is here and it's time for me to do something for my lovely readers. It's time for my 12 Days of Christmas Giveaway Bonanza. Over the next few days I shall be announcing a plethora of fabulous giveaways. They are all easy to enter, especially if you follow my blog. I'm starting with this rather stylish Retro Hot Air Popcorn Maker from Find Me A Gift, the online gift retailer. We'll all be wanting one of these after the excesses of Christmas. Low fat snacking, it's definitely the way to go in January. This giveaway is open to UK readers and will run until the 24th December 2014. 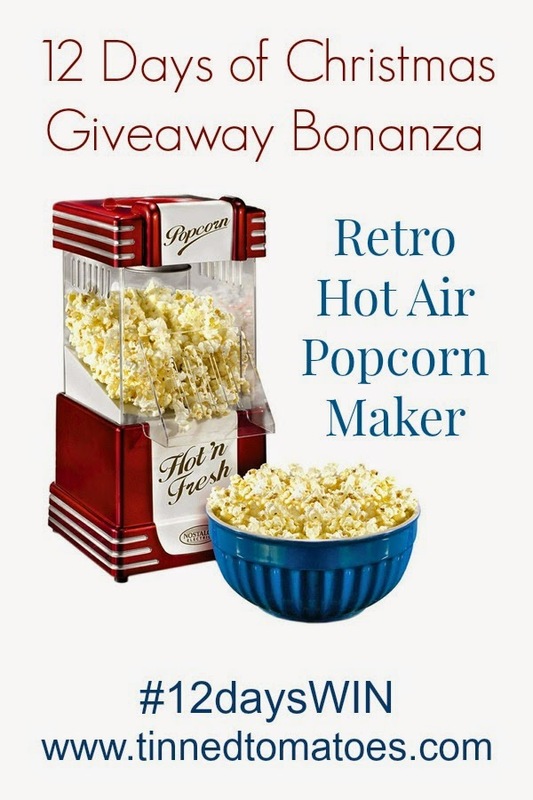 To enter leave me a comment telling me if you prefer your popcorn sweet or salty, then enter via the Rafflecopter box below (it make take a moment or two to load). There will be extra entries for my loyal readers. Disclosure: Find Me A Gift are supplying me with one prize for my readers. I am not receiving product or payment. My favourite is a blend of sweet and salty, just like I love chocolate with a hint if sea salt! Yum! Definitely sweet. I love the lightly sweet stuff from the cinema and as an even bigger treat, the heavily coated caramel popcorn you can buy from the supermarket. I love a mix of salty and sweet! sweet please! Coconut and vanilla preferably. I like to mix the two together, yummy! I prefer sweet but will eat any..!!! I like to mix salty & sweet! Chilli & lime is my fave! I love both. But if I had to pick one, it would be salted. Sweet I love the best. Depends on my mood tbh, although right now probably salted. Salty! Maldon salt is non-negotiable. Salty. In fact I like it best of all tossed in a little bit of Marmite. Think "Twiglet popcorn"
I actually love the mixed sweet and salty popcorn! I like both... I usually ask for 'half and half' when I go to the cinema! I don't actually like popcorn but I'm entering this in the hopes of gifting to my boyfriend who is a massive popcorn lover and his preference is sweet! Definitely sweet - my favourite combo is Banoffee popcorn (chopped dried bananas and just a a sprinkling of fudge chunks tossed through warm popcorn) - it's amazing! Got to be sweet for me! sweet .. but, I recently tried cheesy, and quite liked it, too. Sweet but I'd like to try the sweet AND salty you can get now. I love sweet and salty together. Yum! I prefer the salt and vinegar kind! I love salty popcorn and i do add extra flavourings of my own - cheese powder or dried onion or crumbled bovril cubes!! I love a mixture of both sweet and salty! Always used to be sweet until after I had my second daughter and then I got a taste for salty so now I like sweet and salty at once! Always sweet :) Cinema sweet! Has to be sweet - but my ultimate favourite is toffee! I like both, depending on what mood I'm in. I accidentally clicked follow on instagram. I don't have instagram. Sorry - pleasse can you delete that entry. Thanks. I have always been a toffee popcorn kinda gal, but I have been dieting all year, and my savoury snack of choice - crisps! - are off limits, so I have developed the taste for salty popcorn!! Depends on my mood! I love all the flavoured popcorn too. At the moment I would opt for salty. It's got to be sweet varieties for me. Although I'm normally a savoury type of gal I prefer sweet popcorn. both, I love a mix! buttery with a little salt, or else caramel. Sweet & salty mixed together!! sweet every time - salted popcorn is just wrong!! My favourite popcorn has to be salted, love it! Sweet, perhaps even with some chocolate on!! i prefer sweet but will eat both! Salty popcorn, which is funny as I have a sweet tooth normally! Only sweet, don't like salty! I love salty buttery popcorn! Yummy! Savoury - with dill or bbq spices.